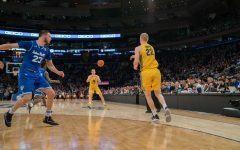 It was nearly impossible to reach a consensus when it came to expectations for men’s basketball at the start of the year. There was certainly talent there, but losing star big man Henry Ellenson to the NBA Draft left an enormous hole. Would the newcomers, transfers Andrew Rowsey and Katin Reinhardt and freshmen Markus Howard and Sam Hauser, be able to not only make up for Ellenson’s loss, but also help take Marquette to the next level? The BIG EAST’s coaches weren’t sold and placed Marquette seventh in the preseason poll. Head coach Steve Wojciechowski wouldn’t pick where the team would finish in the BIG EAST Conference standings publicly, but he emitted an aura of positivity. His expectations were spot on. 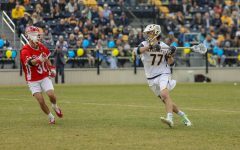 The 2016-’17 season came to a conclusion in Greenville, South Carolina Friday, a week later in the season than the past two years. 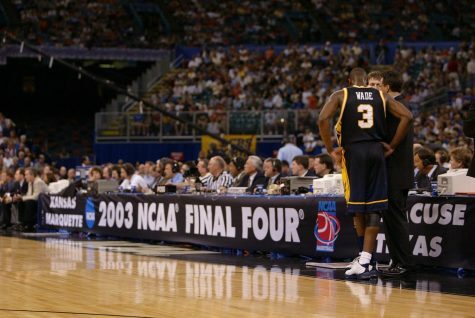 Marquette made an appearance in the NCAA Tournament for the first time since 2013 and the first time under Wojciechowski. It’s one of a handful of accomplishments this season will be remembered for. 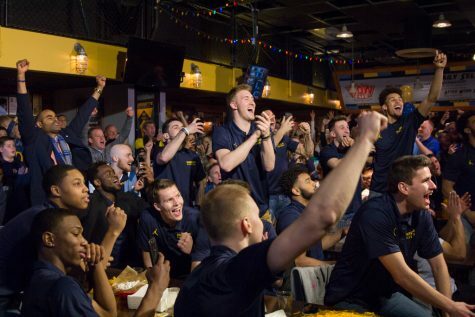 If the 2016-’17 season won’t be cherished for Marquette’s return to the tournament, it will be for the greatest regular season victory in program history. Jan. 24, Hauser grabbed the rebound after a final attempt by No. 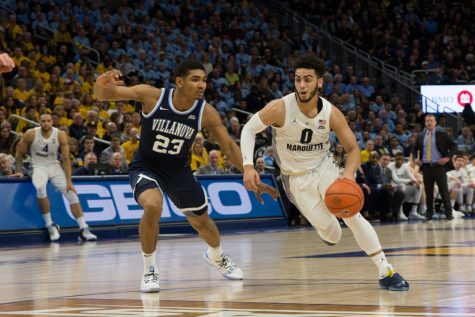 1 Villanova to seal Marquette’s first regular season win against a No. 1 ranked opponent in program history. 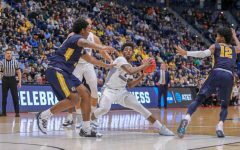 Add in a handful of additional victories against the top of a talented BIG EAST Conference, sweeping Xavier and Creighton, and Marquette fans had plenty to celebrate. That doesn’t mean the road was easy. 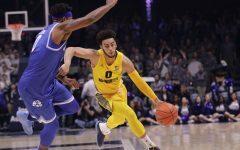 Marquette opened the season with a dominant victory against Vanderbilt but fell flat at the 2K Classic, getting manhandled by Michigan and blowing a lead against Pittsburgh. 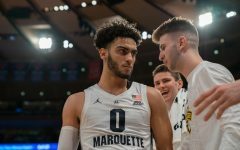 The Golden Eagles had no answer for Wisconsin’s Ethan Happ as the Badgers pulled away from Marquette in the second half. The roster was still in flux as Wojciechowski tried to piece together a lineup featuring many new parts. Rowsey, one of the team’s top talents by the end of the season, barely played in the first few games. 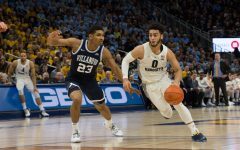 Reinhardt, who was instrumental in the Villanova win, went through a huge slump before it was revealed he was dealing with an injury. Two players left the program during non-conference play. 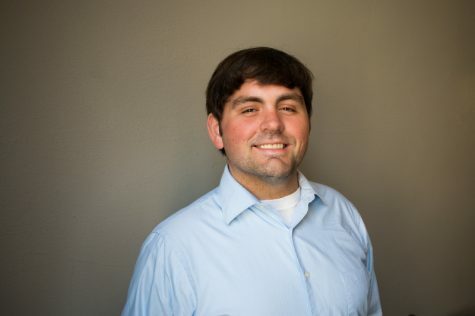 Sandy Cohen, one of the team’s best defenders, transferred to UW-Green Bay. 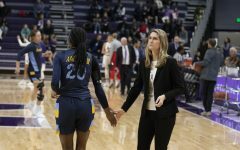 Traci Carter, last year’s starting point guard and the best passer among the point guard trio, left for La Salle, citing a wish to be closer to home. 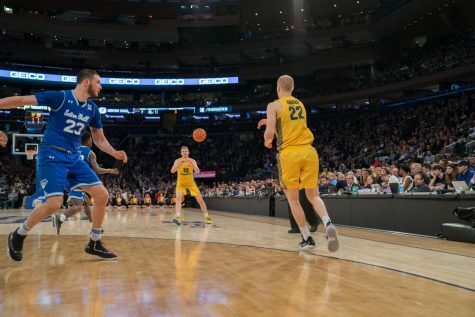 Even after it seemed Marquette had figured things out and was in the fast lane to the tournament, a handful of crushing losses following the Villanova game likely took some years off fans’ lifespans. The team fell to Providence at home and then to St. John’s on the road. 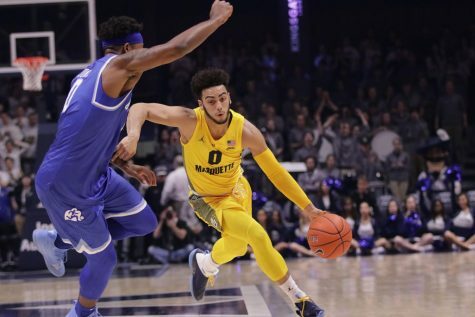 The adversity never sunk Marquette too far, as the newcomers meshed together well. 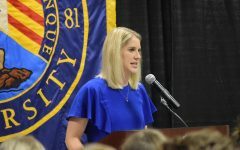 Howard and Hauser started nearly the entire season and weren’t overwhelmed, with Howard shooting nearly 55 percent from 3-point range and Hauser serving as a reliable defender, spot-up shooter and the team’s leader in minutes. On certain nights, Rowsey and Reinhardt were each the most valuable player. 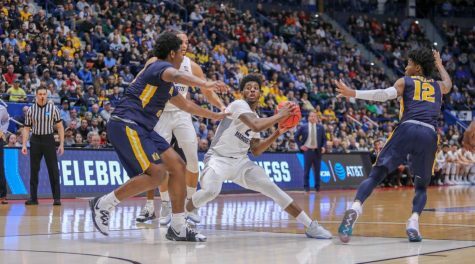 After the losses to Providence and St. John’s, Marquette still got to its goal of ten conference wins, the mark the team felt they needed to hit to make the big dance. That meant ending the season with victories at Xavier and home against Creighton. 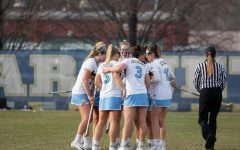 Now, the focus turns toward the future and building on the success the team has experienced. 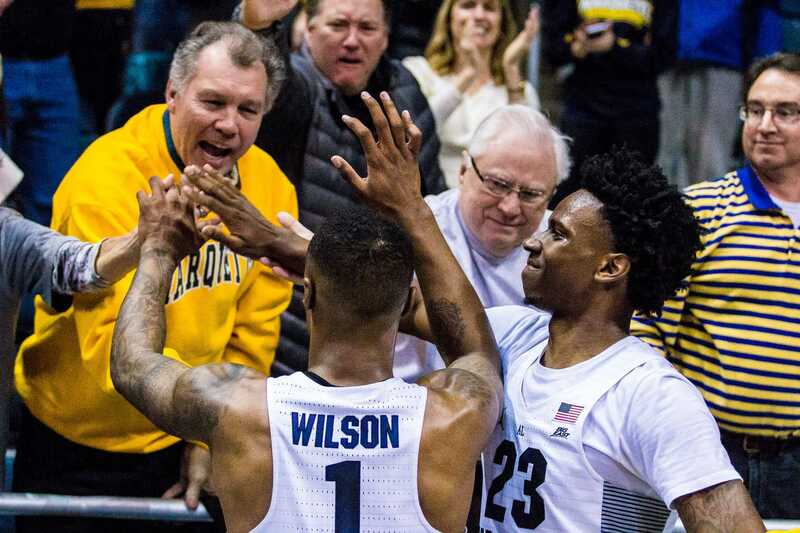 The team loses three seniors with vital roles, Luke Fischer, Jajuan Johnson and Katin Reinhardt, but another year of Rowsey and continuation of the maturation process for Howard and Hauser leave room for plenty more optimism from Wojciechowski. 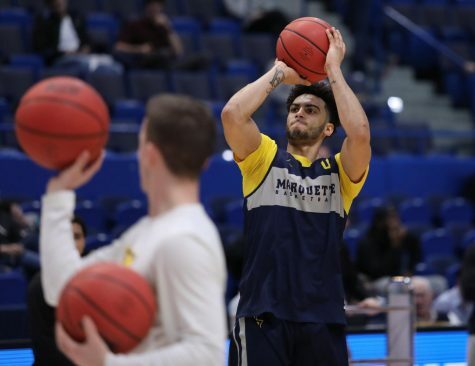 Harry Froling, who transferred from SMU, came overseas from Australia with high expectations, and he’s already trimmed down working with Marquette trainer Todd Smith. 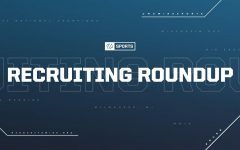 Wojciechowski brings in a solid three-man recruiting class in Jamal Cain, Theo John and Ike Eke. 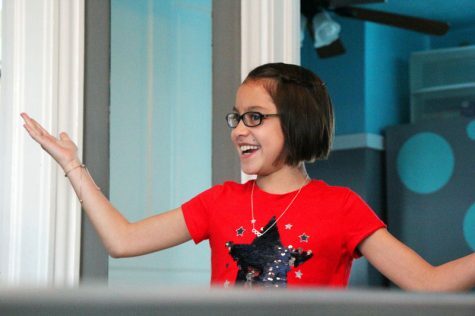 “This is definitely not the last you’ll see of anyone,” Fischer said.